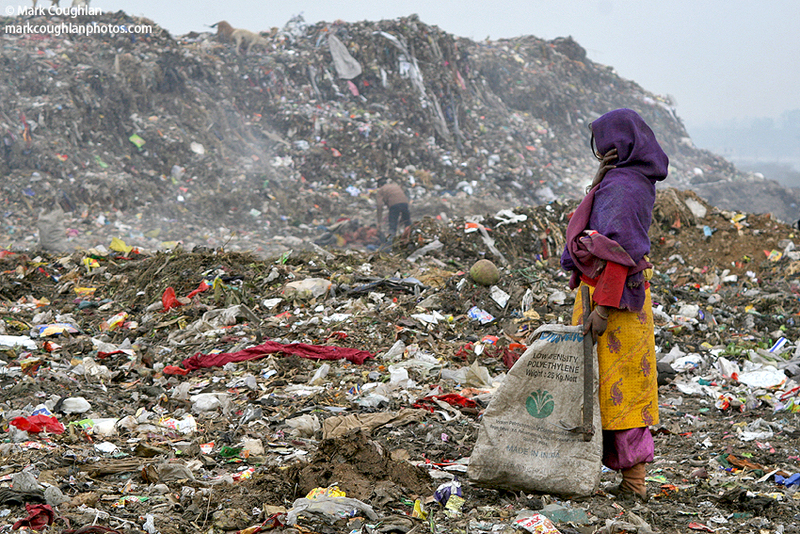 Towering several hundred feet in the air and stretching a mile or more across, hundreds of Delhi children climb rubbish mounds at Delhi’s Ghazipur dump yard every day. More than 1,000 people make their entire living scavenging here at the Ghazipur “Highway” dump, 30kms north of Delhi where the refuse of the city is consigned. They are recyclers of sorts. But, for them, recycling has nothing to do with environmentalism or the green movement – it is about daily survival. Without gloves or boots, they trawl through mounds of rubbish to find anything that can be recycled. No one knows how many Ragpickers there are in India. In Delhi alone, there are more than 300,000. They earn 60-100 rupees (£0.80-1.35) for eight hours’ work. Most of the rag-pickers are extremely poor, illiterate and belong to rural immigrant families. Many commence their profession at the young age of five to eight years. Most of them never attend any school or have any formal education. Most of their families are in need of extra incomes from these young children. While they are collecting rags they are subjected to chemical poisons and infections. Because of malnutrition they suffer from retarded growth and anaemia. The rag pickers are very susceptible to diseases like tuberculosis and cancer due to their exposure to hazardous materials. The vulture-like birds, ever-present pray over-head with stray dogs and cows wandering about, finding scraps to eat.